‘Blockupy‘ protests against “the widespread impoverishment and denial of democratic rights occurring in the Eurozone as part of a global systemic crisis” shook the financial epicenter of Europe – Frankfurt – last week. 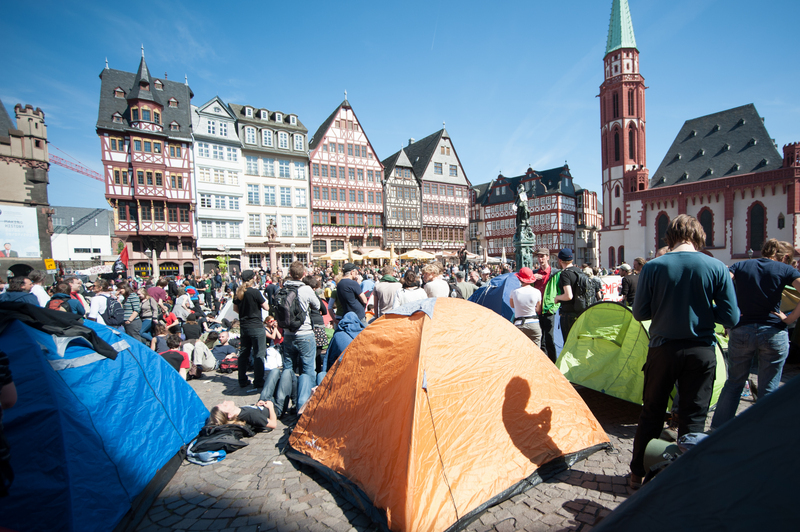 Following the global action days on 12 and 15 May, 2012, (12M and 15M), activists from across Europe were called to converge in Frankfurt in an international solidarity demonstration. The ultimate goal was to blockade the European Central Bank (ECB) and other crucial global capitalism institutions. On May 4, however, the Frankfurt Municipal Department for Public Order announced that all actions planned were deemed illegal, except for a rally on Saturday, May 19. Occupy Frankfurt in front of ECB. Photo shared by Roarmag.org (copyleft). Still, thousands of activists decided to take a stand against the ban and claim the constitutional right “of unarmed assembly, without either prior registration or permission”. While international mainstream media didn't give much attention to the events, online social networks buzzed with citizen reports on the mobilizations that occurred under massive police presence and repression. 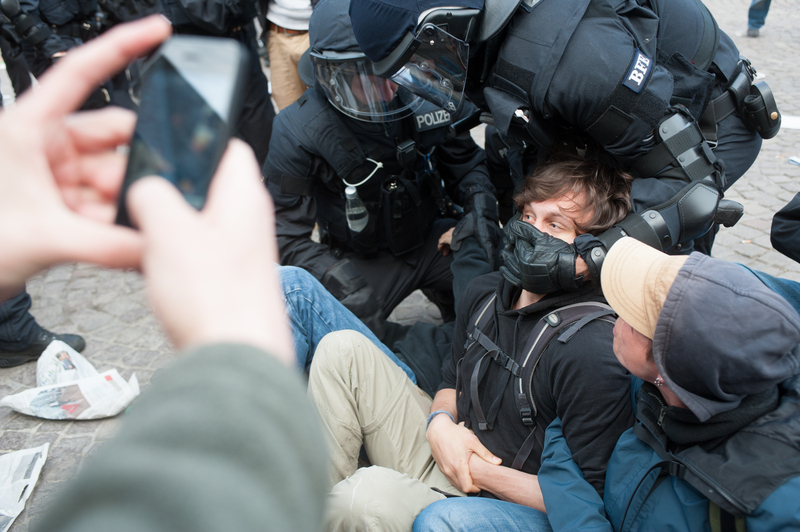 On Twitter many videos and photos were shared under the hashtag #Blockupy. 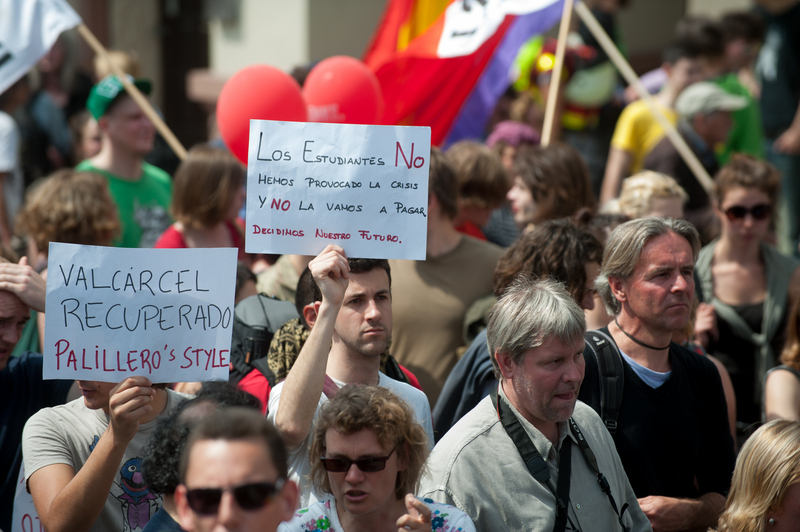 Netizens and collectives from different countries, such as Occupy Brussels and Belgium, livestreamed the protests, marches and assemblies, as well as the cultural program and diverse debates on labor, ecology, economy among others. Blockupy started on the same day that newly elected French President Hollande met Chancellor Merkel [fr] in Berlin, May 16. Meanwhile in Frankfurt, the police complied with the order of eviction of the seven month long Occupy Frankfurt settlement around the Euro sign near the ECB headquarters. 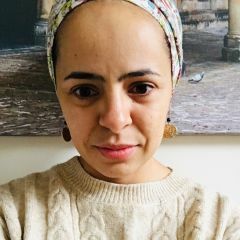 The blog Critical Legal Thinking, which had a comprehensive coverage of the four days of protest, described the city as “effectively in [undeclared] State of Exception“. 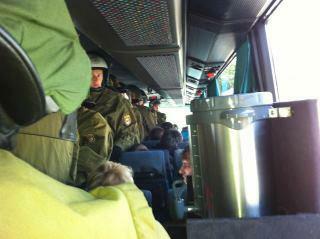 Police intercept three Berlin buses on the way to #Frankfurt. Photo by @Blockupy on Twitter. On May 17, a bank holiday, as mainstream media directed the spotlight to the German Finance Minister Wolfgang Schäuble – who was awarded the Charlemagne Prize for his major role in the definition of the austerity policies mostly imposed on the periphery European countries – buses filled with activists from different cities heading to the anti-austerity demonstration in the center of Frankfurt, were stopped from entering the city and escorted back by the police. Despite the attempts of intimidation, around 2,000 activists managed, at least for a few hours, to occupy the historic Roemerberg square where the city hall is based, and which represents the birth of democracy in Germany. 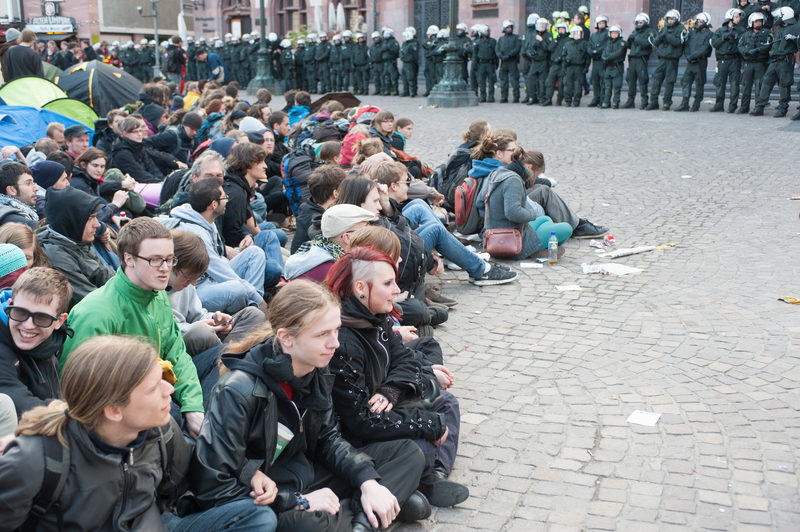 Blockupy protesters take action against banking and finance system. Photo by Patrick Gerhard Stoesser, copyright Demotix (May 17, 2012). Protesters sit down and lock arms in opposition to police presence. Photo by Patrick Gerhard Soesser, copyright Demotix (May 17, 2012). A protester is detained by police. Photo by Patrick Gerhard Stoesser, copyright Demotix (May 17, 2012). 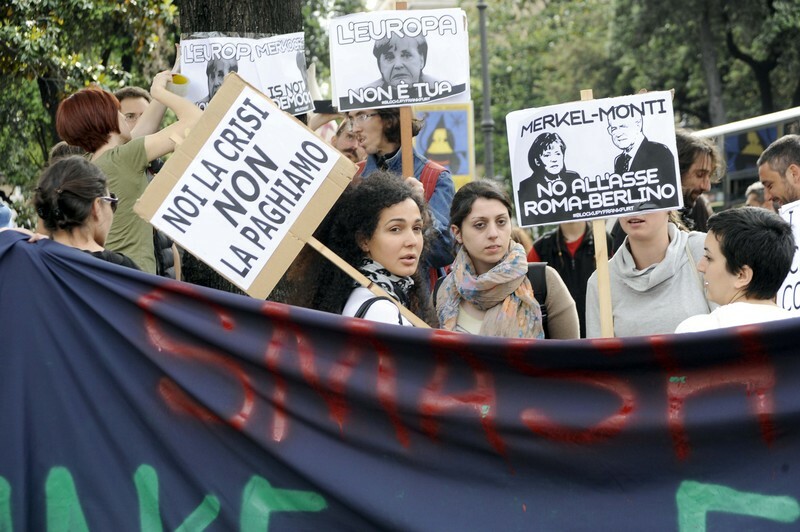 Embassy of Germany in Rome – Protest against repression and arrests in Frankfurt during the protests against the crisis. 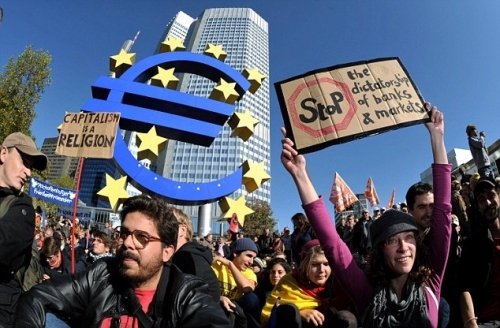 Signs against the Rome-Berlin axis, the ECB and Merkel. Photo by Simona Granati, copyright Demotix (May 18, 2012). as the activists here prepare to physically block the headquarters of the European Central Bank, the police already seems to have done the job for them. "I block! You too?" Photo by ateneinrivolta on Flickr (CC BY-ND 2.0). That day, international mainstream media reported on Goldman Sachs being hired by the Spanish government to evaluate banking conglomerate Bankia, taken over by the state earlier in May, and also about rumors of a referendum in Greece to ballot the membership in the Eurozone. In Frankfurt, while banners read messages of support to the European southern countries (such as “We are all Greeks“), the city remained “affected by massive police presence, identity checks and road blocks“. When the legal day for protesting finally arrived, May 19, around 20,000 protesters (according to the police, or more than 25,000 according to the organization) rallied the city center. 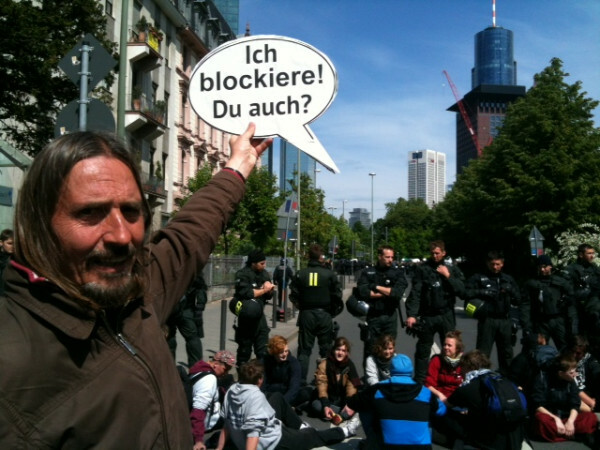 Blockupy Demonstration in Frankfurt. 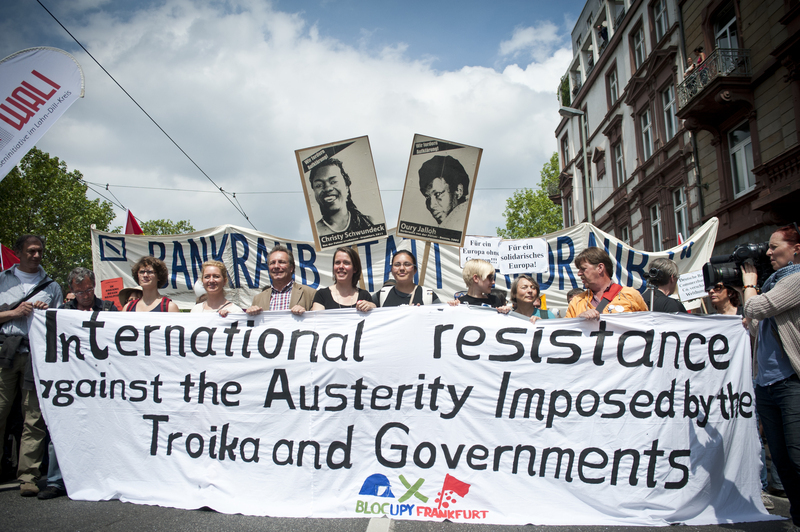 A large banner held up by protesters reads: 'International resistance against the Austerity Imposed by the Troika and Governments.'. Photo by Michele Lapini copyright Demotix (May 19, 2012). 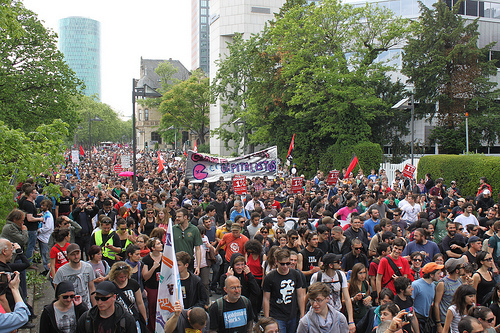 Blockupy Frankfurt: More than 20,000 against financial crisis politics. International participants in the demonstration. 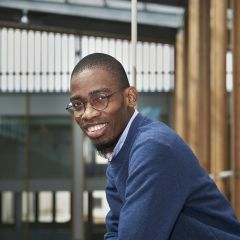 Photo by Patrick Gerhard Stoesser copyright Demotix (May 19, 2012). Blockupy demo (May 19, 2012). Photo by strassenstriche.net on Flickr (CC BY-NC 2.0). Those people in the streets rioting, the protesting classes, are fighting not for internal political change within their own countries, but (whether they know it or not) for a re-arrangement of the political balance of an entire continent. This post is part of our special coverage Europe in Crisis. I find it extremely dangerous to fall atrap of the anti-“austerity” narrative. The cuts are not about austerity, they are about weak financial market regulations and liberalisation and the fallout of it. Austerity is just the soft landing of that fallout. what really needs to be done is to forge an order for financial stability, not destablelise the order by further indebtment, inflation and so called “growth” policies. What is often overlooked is that the option of devaluation equally translates into financial losses for a society. 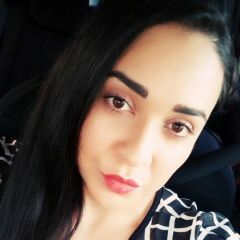 We have now a system in Europe where some steering wheels are blind and we did agree on that system for a reasons, it is just plain moronic to advocate for bananan currency methods as the panacea.